Games where we can become the monarch and wise to rule the country, fully in the overall strategy. Games where you can become a monarch, and deliberately destroy the state less, but there is – Tropico and her colleagues. But it is unlikely that you know at least one game where all operating problems are solved simple Yes / no, and the ruler does not live five minutes in real time. The best publishing firm in the world, Devolver Digital, injustice eliminated under her wing, left the game Reigns is definitely the strangest hit of the summer. 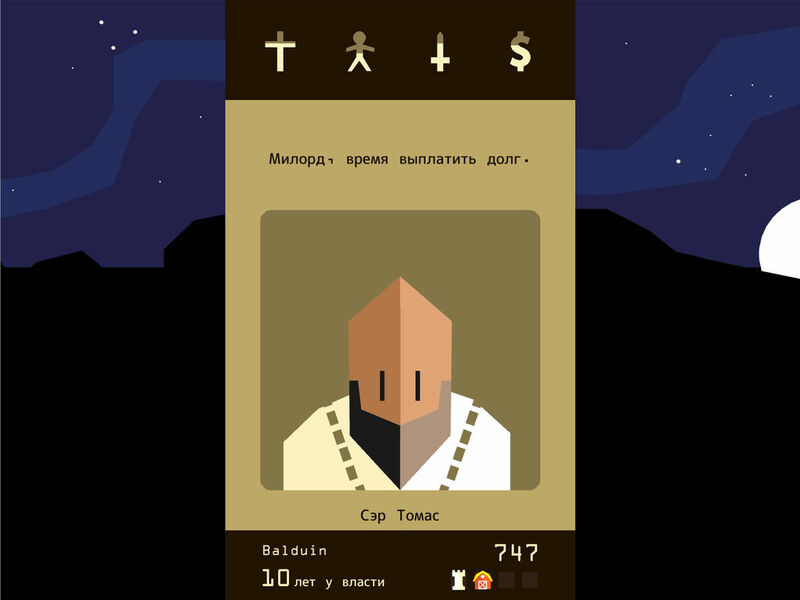 Reigns is arranged in unusual, but just be sorted out in a jiffy. The monarchist front of your eyes will fish out the people cards, usually entourage. On their suggestions, requests, threats, and other initiatives can be answered in two ways: figuratively speaking, “Yes” and “no”. Each card symbolizes the year of the reign; if we make it more than 20 years, will be good. Sometimes people come with some outright nonsense, but most often the issues are important. To marry the Princess of a neighboring state, to put the guards to the Palace (at night we hear noises) and whether the attack on wanton aggressor. Choose wisely – your work is controlled by three structures and the state budget: for example, if highly offended with the Church, you will be hanged. However, the threat and reverse the outcome – a full scale loyalty of the Bishop means that soon you will be declared a Martyr and hang – the highest award from the religious people. In addition, it is possible to die three more in dozens of ways – the game even has a separate achivka for this dubious achievement. You can swallow the dragon, enter the demon, to marry a witch and God knows what else. And that’s not counting the classic deaths of the rulers – intrigues of competitors and popular revolt. Therefore it is necessary to think three times before – all the more so with each new ruler will open the additional card. In the retinue of the king stuffed talking bird, and it is unclear what it will bring. 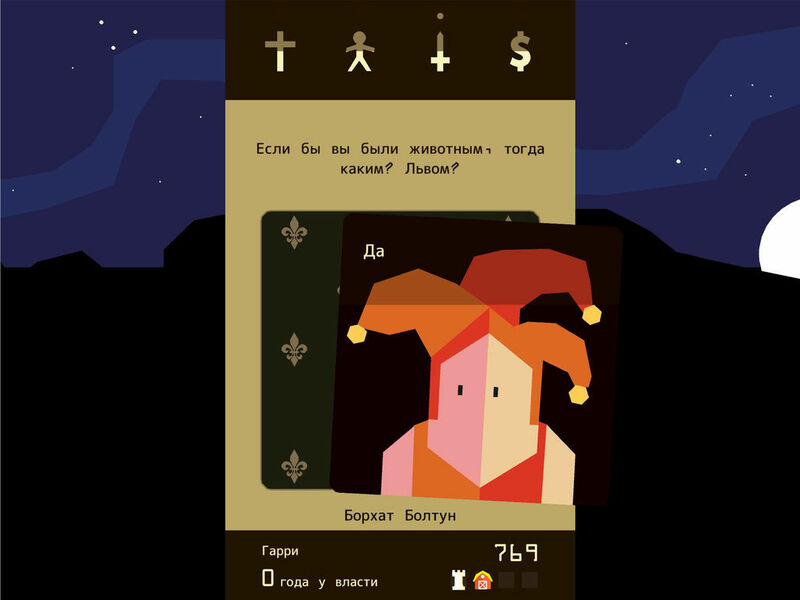 In General, Reigns is difficult to predict what will happen next – for this indicator, the game will hit even roguelike-rpg, where a successful party can result accidental pressing. However, it makes Reigns a very exciting project – you shuffle cards, make tough decisions, and then – right there! see how they end. Imagine “the Witcher”, where the consequences of the next choice reflected not in ten hours, and instantly. In addition, the game skillfully presses on the ambition – well, I’m 30 years already survived it once, I can and update the record! Reigns is 229 rubles, and this may seem an excessive fee for it seems like it. But this is not true: Reigns can drive for hours, if not days; in the game a hell of a lot of content, it just opens immediately, but eventually. The conditions that were initially, and those that will be after a hundred years of cumulative Board – radically different; different and game. So don’t worry that will give decent (by mobile standards) money on disposable game Reigns will brighten up your leisure hours. And there’s a lot of cool jokes! Seriously.